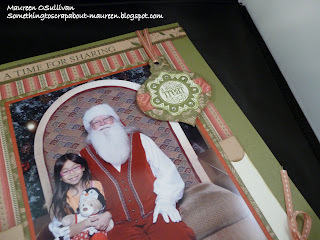 This past weekend, I celebrated a Christmas in July scrapbook event. 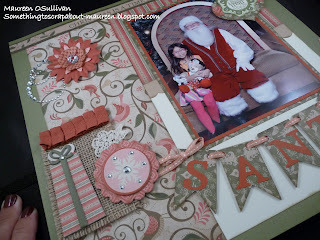 To get myself in the Christmas mood, I cracked open the new CTMH Christmas paper and supplies and boy was I pleased! 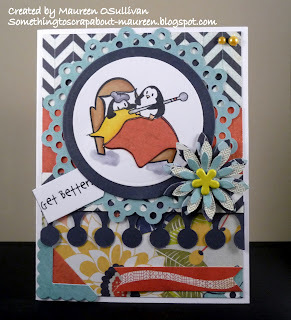 At first glance, the CTMH Pear & Partridge line appeared formal, but through the use of the coordinated dimensional shapes, burlap, flowers and bling, it all worked-- as usual:) I got a lot of "ooo's and aaa's' over this layout! Both my husband and my daughter Abby were pleased too. The ornament was cut using the new Artiste cartridge, along with ornament sentiment. To cut out the pennants, the CTMH AP cartridge was utilized. I'm loving both of these cartridges. All of the supplies are CTMH and are listed below the pictures. 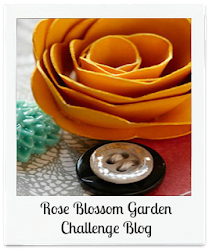 Let me know what you think and happy Christmas thoughts to you! Paper x7162b; Dimensional Shapes z1772; Just Blooms Paper Flowers z1764; Bling Assortment z1466; Sparkled Flourish z1708; Designer Ribbon Red z1615; Burlap Ribbon z1760; the 'Very Merry Stamp Set s1210a and CTMH Artiste Cricut Cartridge. Although I always look forward to the new catalogs, it does often mean some items will be retired. For the August 1st catalog release, CTMH will be moving away from carrying a color palette of 60 and instead carry 42 colors. Still lots of colors to choose from. The retiring inks are listed below and will only be available while supplies last. 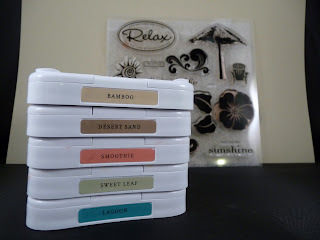 So, if you have any of the stamp pads below and can't part with them, then order some re-inkers. Or, if any of these inks have been on your wish list, then now would be a good time for your wishes to come true! CTMH is offering 6 new colors. More to come on that! A fellow craft friend of mine, Toni Lopes, created the card below. Toni blew us all away in the class-- she had the hair and face patterns down! 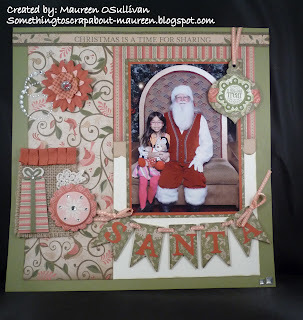 Toni makes a lot of cards for her grand-daughter. As you can see, the practice has paid off! Toni used Some Odd Girl's 'Sweet Thinkin' Mae'. Hi there! As you know each month CTMH offers a Stamp of the Month (SOTM) at a discounted price of $5.00 when you place an order of $50.00 or more. I've been waiting for July's stamp to come out. 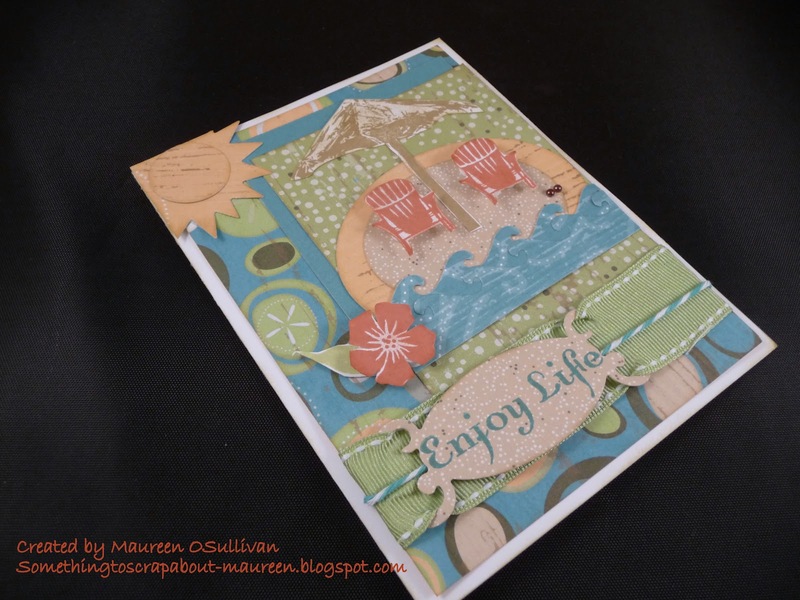 The name is 'Live Out Loud' and it's one of those stamps that can be used for both card-making and scrap-booking-- fun, fun, fun! 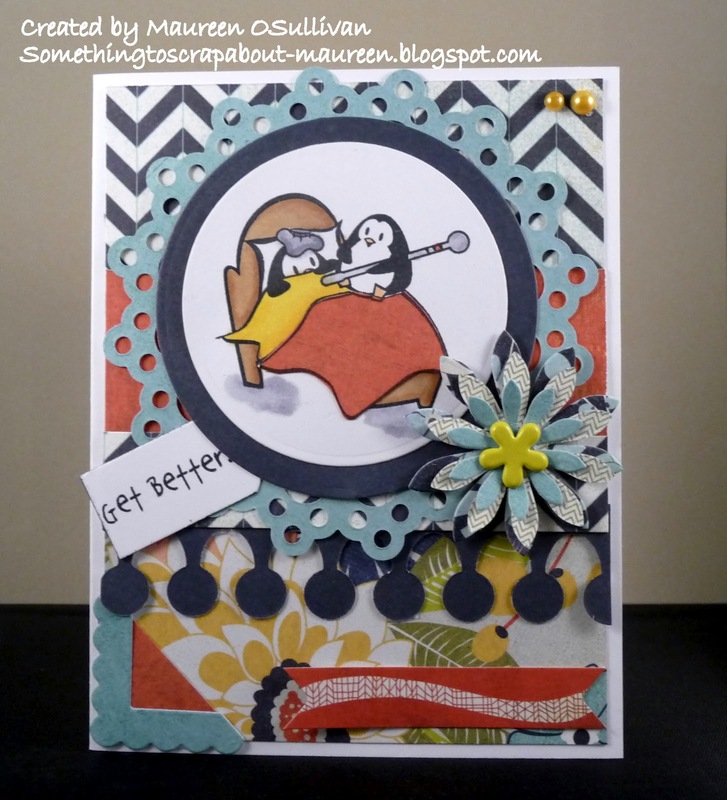 Below is a card I made for my teen-age daughter who is at camp for 4 weeks-- miss her:( Also, I'm planning on using this stamp for a Layout that I'll be creating for my teenage daughter. In addition to the 'Live out Loud' phrase, there are other ones such as 'Just Be', 'Soar', and 'Imagine the Possibilities'. Lots of nice sayings. 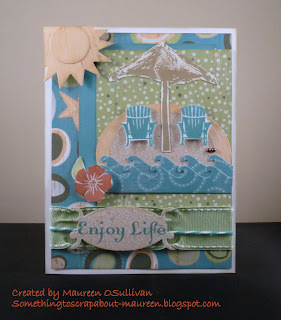 The paper that I chose was from CTMH's Crusin' line, which will be discontinued after 7/31/12. All the shapes, with the exception of the chevron, were cut using CTMH's Art Philosophy Cricut cartridge. As a teaser, I put in some black striped gross-grain ribbon (z1781) that CTMH just started carrying. This black ribbon will be available on August 1st for customers. 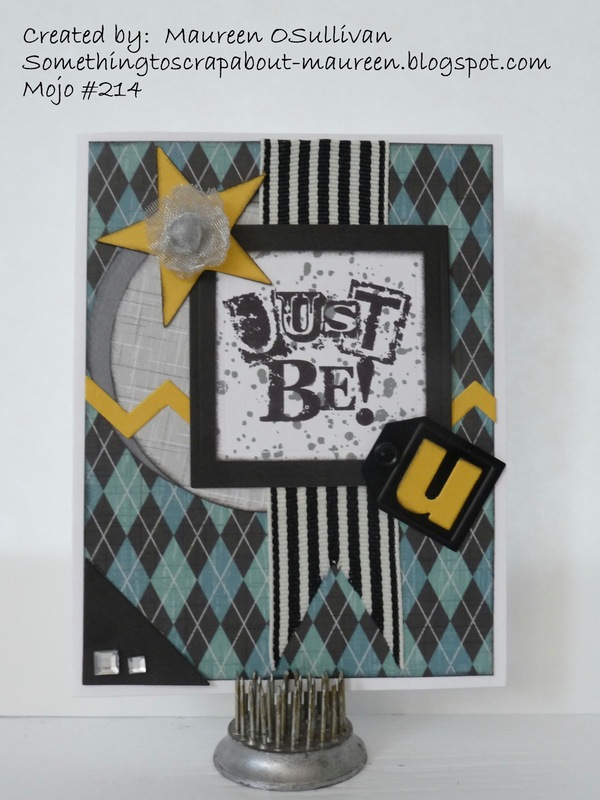 To create a background for my 'Just Be' sentiment, I stamped the ink sprayed look on using Grey Flannel ink. 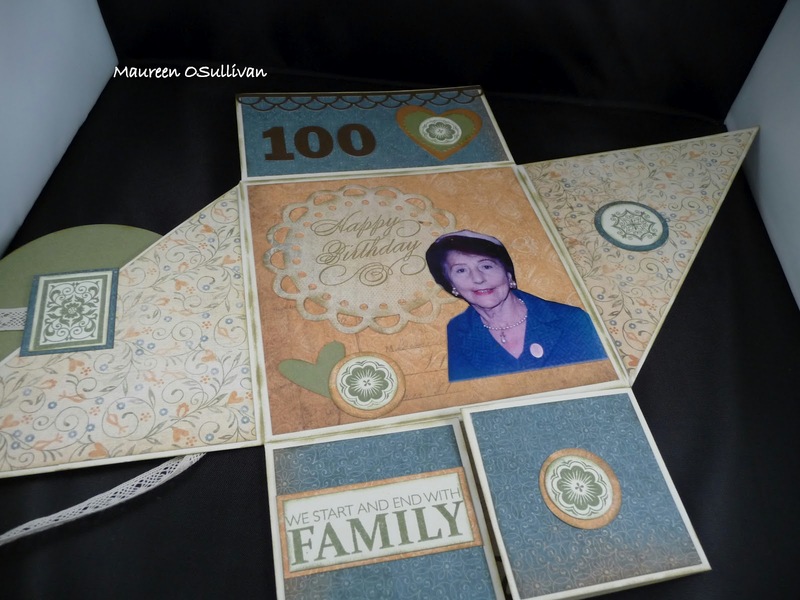 The Diverse Background stamp (D1508) comes with 4 backgrounds. I loved the ink droppings because I don't have to spray ink on and then wait for it to dry. CTMH is very clever! Lastly, I based my sketch on a Mojo Monday sketch #214. Funny, who would have thought that my nickname 'mojo' would now be a site that I look to all the time for inspiration. I've been mojo for since I was 15! Updated picture. Just ordered my set!!! Hello again! I was asked to make a birthday card for a woman that is turning 100! Of course this did not call for just any type of card. 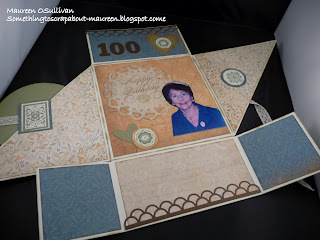 After all, it's not everyday that someone celebrates 100 years! 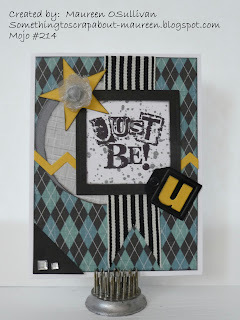 After I found the type of card to make, I then had to figure out what say. My husband actually thought of a good idea-- a celebration of 100 years with family and friends. 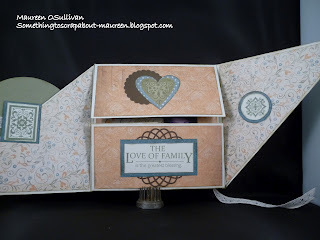 As always, CTMH had the perfect stamp set "Family Love" (D1506). Next, I used the CTMH Florentine paper line and stickers; along with some coordinating metal embellishments. Fortunately, the Florentine paper line will be carried in the new catalog. All and all, I very pleased with how it turned out. I think 100 years deserves an extra special card! Happy Birthday Helen and many more! Hi, I hope you are enjoying the weekend. So glad summer is here. 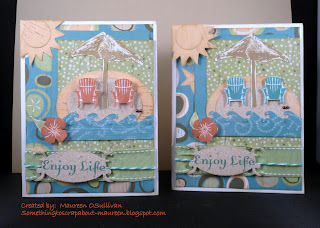 This past winter I purchased the CTMH 'Kick Back' stamp set (D1511). 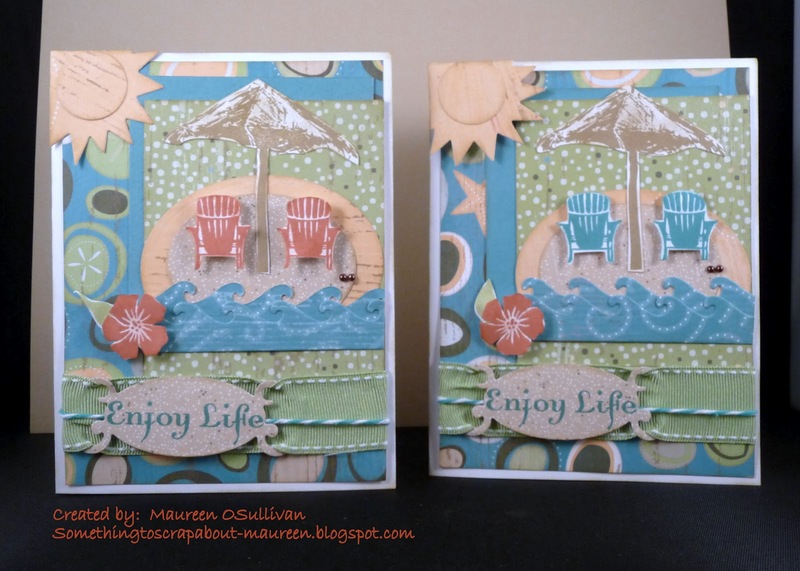 The stamp set reminded me of the Caribbean-- just sitting there under an umbrella, enjoying life, and sipping on a cool drink. Sounds good! 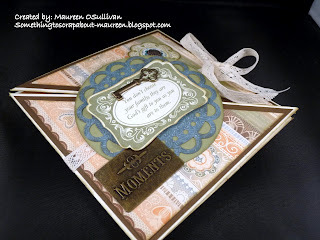 The paper used was CTMH's Footloose. 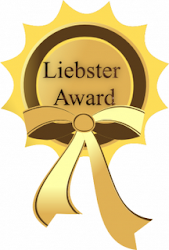 If you like it, better order it as it will retire on 7/31/12. The sketch was based on My Favorite Things (MFT) #79. 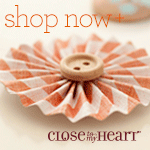 CTMH Perfect Pair-- Earn Free Products! Place an on-line order of $75 or more during July and receive a paper packet and coordinating embellishment FREE—it’s a Perfect Pair! Which specific paper packet and embellishment you receive is based on the date you place their order (see below). This special applies to online shopping orders only, while supplies last. Discounted products do not count toward a qualifying purchase. So, I have the day off. Guess what I did last night....? I made a card! 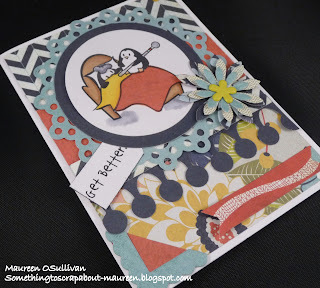 The card is for a close stamper/scrapbooking friend who has been 'under the weather'. 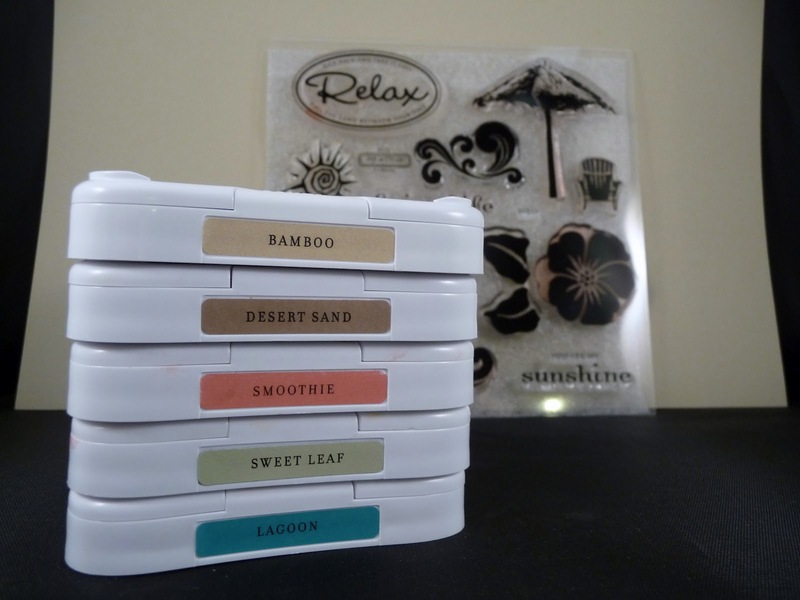 To help cheer her up, I had to breakout this cute stamp set by Cat's Pajamas. Don't let the title fool you, the 'You Sick Thing' stamp set is adorable! My daughter Abby and I are in love with those penquins. All of the dies are from My Favorite Things. The Copics colors used are located in the last picture. 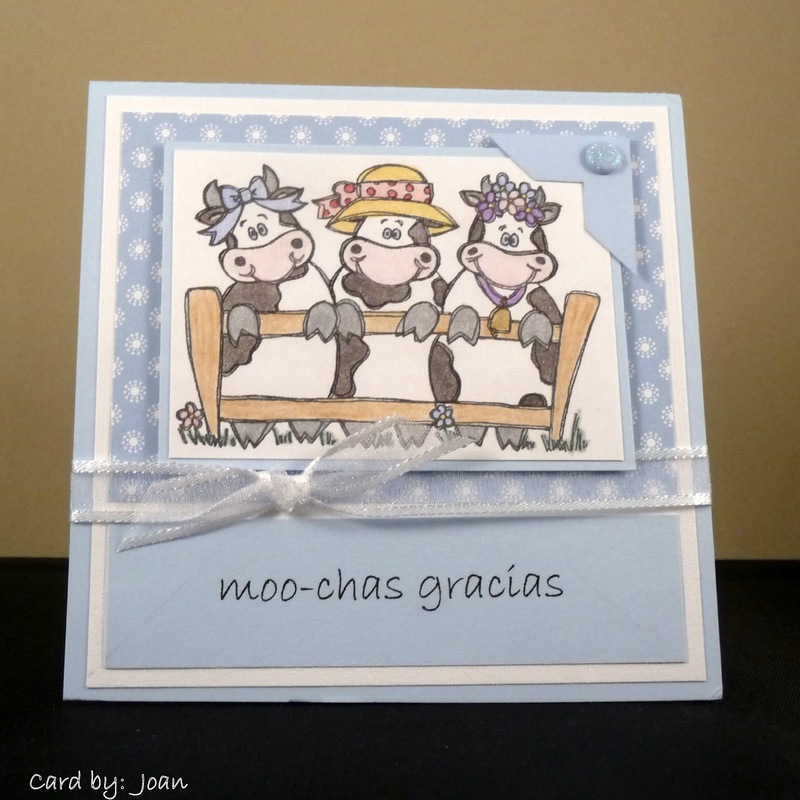 Below is a card by my first guest designer, Joan. I met Joan at the Copics class in June. Joan is extremely talented, as you can see. 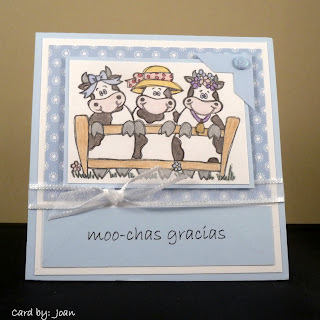 She makes cards for our troups as well as her family.